A Food and Drug Administration agent enters the New England Compounding Center, a pharmaceutical company in Framingham, Massachusetts, linked to an outbreak of fungal meningitis. Nine more people have been diagnosed with fungal disease linked to contaminated pain injections, federal health officials said Wednesday. They said 317 people had been sickened and 24 have died from the mold-contaminated drugs. Of these, 312 had a rare form of meningitis that is not infectious to others but that causes very subtle symptoms and is hard to treat. They were infected by steroid shots into the spine. Five have been infected by injections to the ankle, knee, shoulder or elsewhere, the Centers for Disease Control and Prevention said. As many as 14,000 people may have been given injections from three lots of steroid prepared by the New England Compounding Center in Framingham, Mass. State officials have revoked the company’s license and federal officials raided it earlier this month. Both state and federal officials say they found non-sterile conditions at the pharmacy and say it appears to have made and sold drugs far beyond what its license allowed. CDC says 97 percent of the people who may have been affected have been told of the risk. They said the greatest risk of meningitis comes in the first six weeks after treatment; no one should have received any contaminated injections after Sept. 26, when the pharmacy’s drugs were recalled and officials first raised the alarm. At least one consumer group says the Food and Drug Administration failed to act even though it knew of problems at the NECC. FDA and Massachusetts officials have both said they lacked the authority to move against the pharmacy and said Congress needs to pass clear legislation giving the FDA authority to regulate so-called compounding pharmacies. Dr. Michael Carome, deputy director of Public Citizen’s Health Research Group, called it an attempt to deflect criticism. "The claims by agency officials that the FDA lacks authority to properly regulate compounding pharmacies is contradicted by a long history of remarkably consistent statements and enforcement actions asserting the agency’s legal authority over such pharmacies," Carome said in a statement. The FDA regulates drug manufacturers, and can inspect compounding pharmacies, which are supposed to make drugs for specific patients who need specific formulations on a prescription-by-prescription basis. NECC was one such compounding pharmacy. 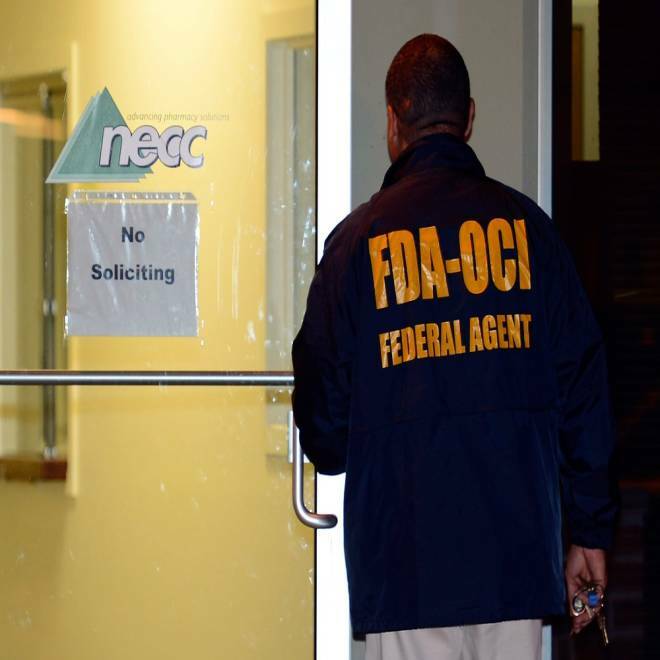 "Prior warning letters from the FDA to the NECC and other compounding pharmacies appear to indicate that the agency considered these pharmacies to be engaged in drug manufacturing. The pharmacies were therefore considered subject to the safety and effectiveness standards required for approval of new drugs, as well as the rigorous manufacturing standards designed to ensure that drugs are sterile and uncontaminated with such germs as bacteria or fungi before being sold and distributed," Public Citizen said. NECC also says regulators were familiar with its operations. "NECC has had a long standing practice of working closely and cooperatively with the Massachusetts Board of Registration in Pharmacy and the Massachusetts Department of Public Health," the company's lawyer, Paul Cirel, said in a statement. "It has always been the company’s practice to provide the Board with full and complete access to its facility and its records. As is standard practice in the health care industry, the Board had numerous opportunities, including as recently as last summer, to make first-hand observations of the NECC’s facilities and operations. Based on that history, it is hard to imagine that the Board has not been fully apprised of both the manner and scale of the company’s operations."